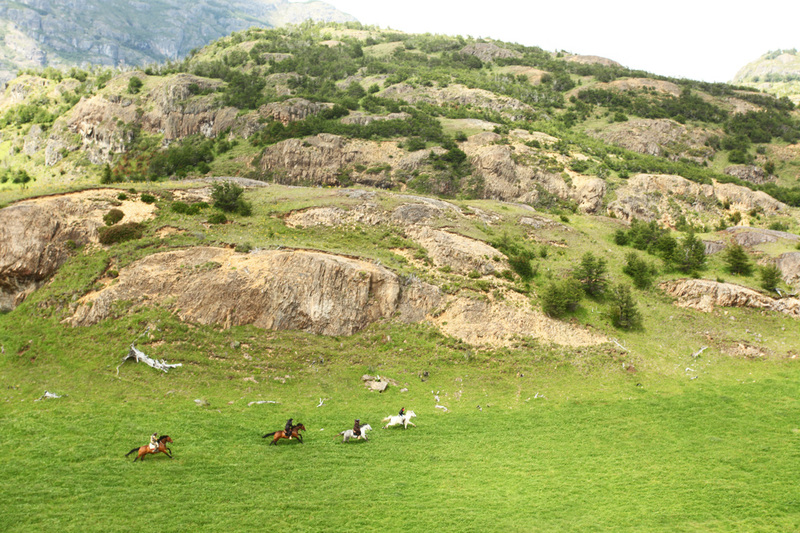 I first fell in love with Patagonia five years ago on a ten day horse riding holiday to Torres del Paine, Chile. A wild, unkept region positioned at the bottom of the earth shared by Argentina and Chile where mountain peaks are craggy and treeless, rivers flow icy and translucent, the winds are swift and constant and flowers grow wild and abundantly. 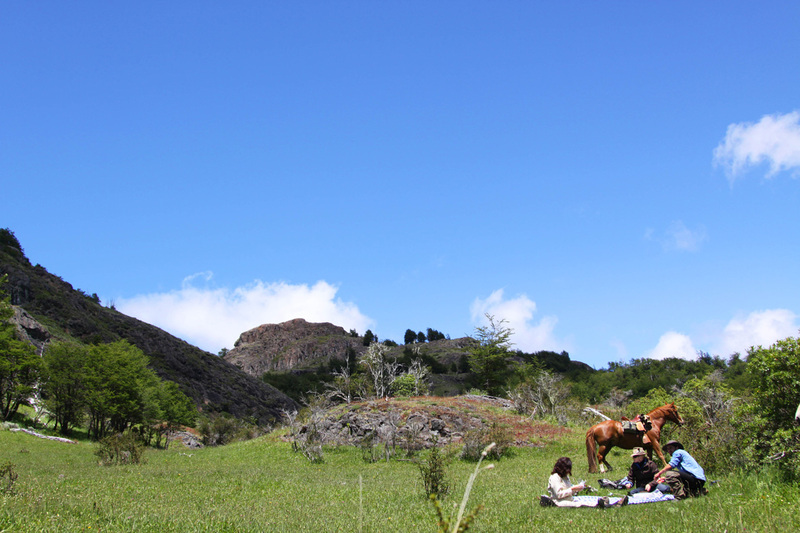 I was bursting with anticipation to return to a different region of Patagonia with two of our G.T guests in tow and our travelling circus (me, Buster, Finn and my mother, Meme). 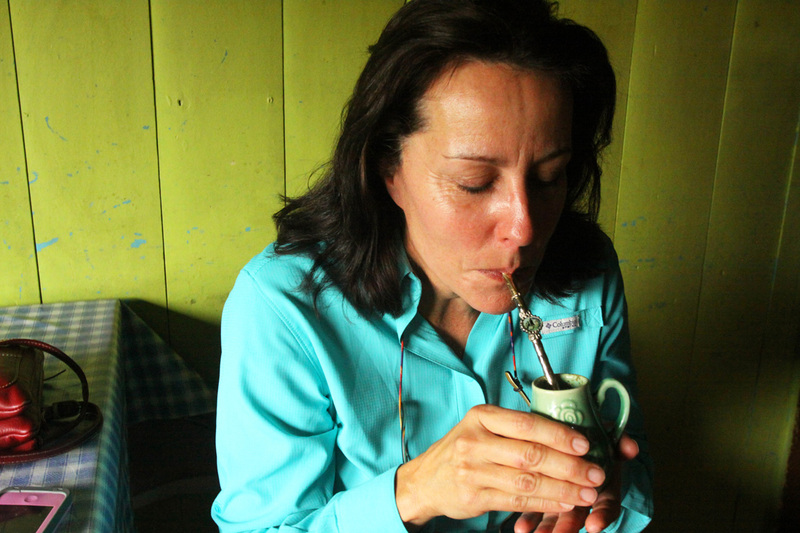 We left Santiago on a regional flight south to a tiny outpost called Balmaceda where we were picked up by our smiley host Natalia Gorrono – who is pictured above. 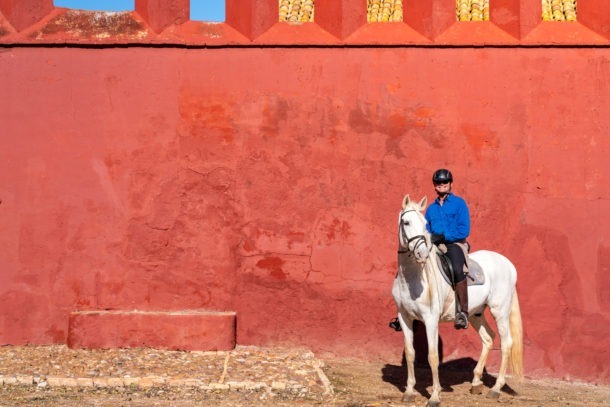 I tell you what after spending three nights in Santiago I was getting itchy feet to start riding and exploring this new estancia I had heard so much about. My tolerance for major cities is limited to no more than two nights, I’m a country girl at heart and I feel like a fish out of water in capital cities. 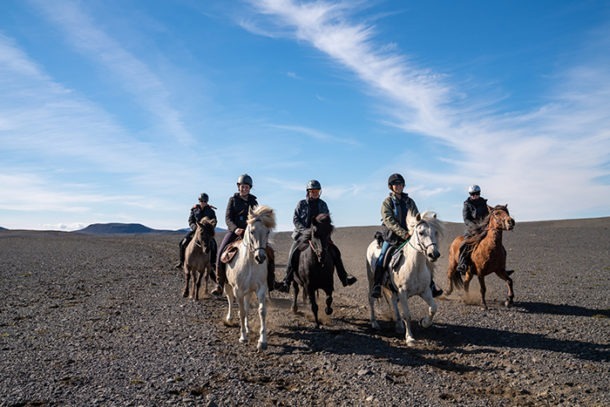 I think my sentiments were felt amongst the entire group, so even though we had to wake at a ludicrous time (4am if my memory serves me correctly) to make our regional flight there was a good feeling amongst us that we would be on horseback that afternoon. Surprisingly in the picture above we look quite bright eyed and bushy tailed while waiting for our regional flight it must of been the caffeine injection we had just received. Our effervescent, smiley host Natalia and guide Sebastian picked us up from the airport where two vans were loaded with all and sundry. 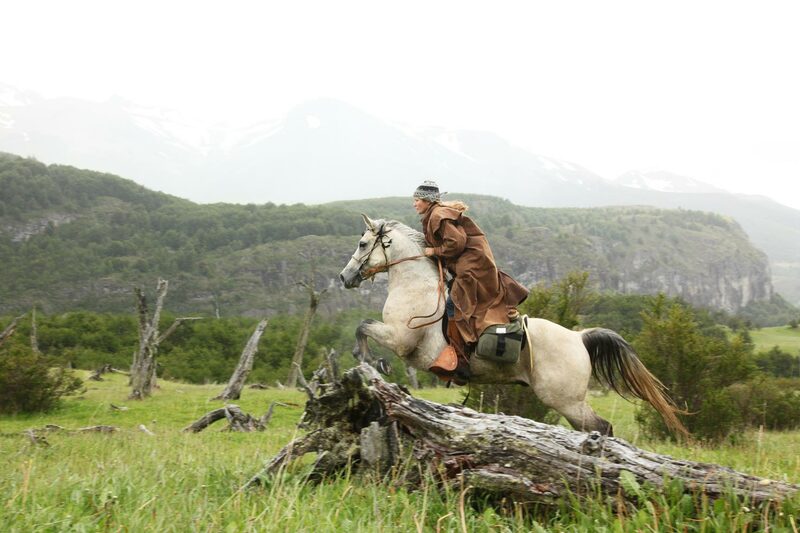 The Patagonian wind was also there to welcome us lifting jackets, tousling hair and whipping hats off heads. 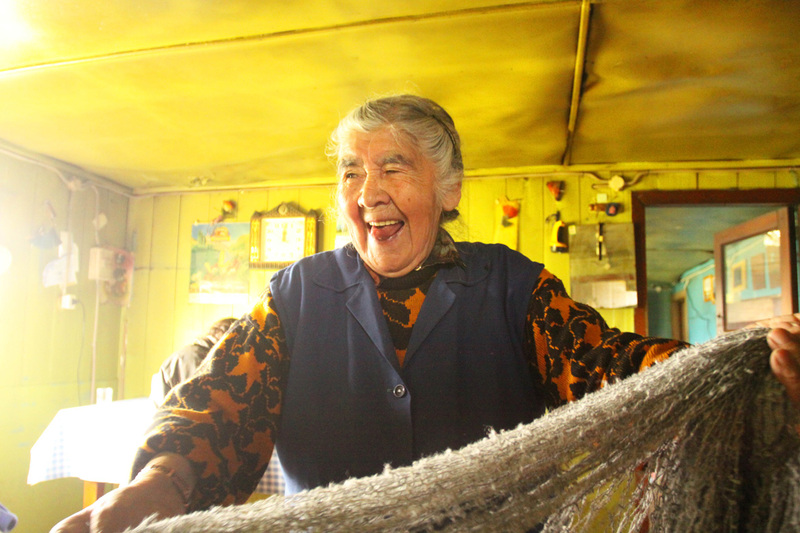 A joyous reminder that we’d touched down in wind-swept Patagonia. 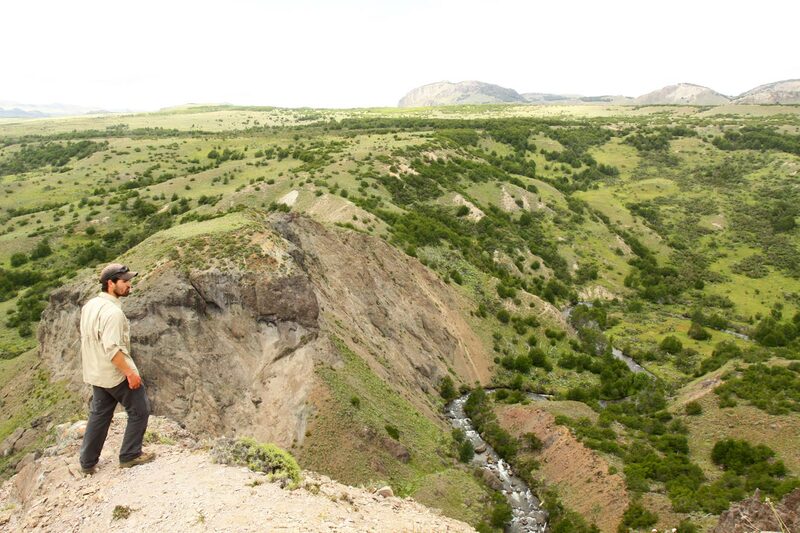 After a three hour trip to the estancia with a tiny detour for refreshments and to eye-spy a condor’s nest (Sebastian pictured above looking for the illusive condor and her nest) and to pluck some bunches of wild flowers we had finally arrived. And what a welcome awaited us chilled, tart tasting pisco-sours, a raging fire and some golden crisp, disolve-in-your-mouth empanadas. 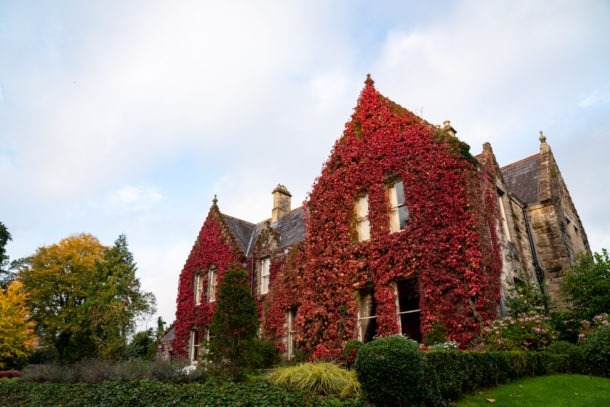 The sigh of satisfaction was audible amongst us all when we sunk deep into the couches knowing that we were now in the care of our lovely host family the Gorrono’s and their impeccable staff. We had to peel ourselves off the couches to be shown to our boudoirs for the next five days. 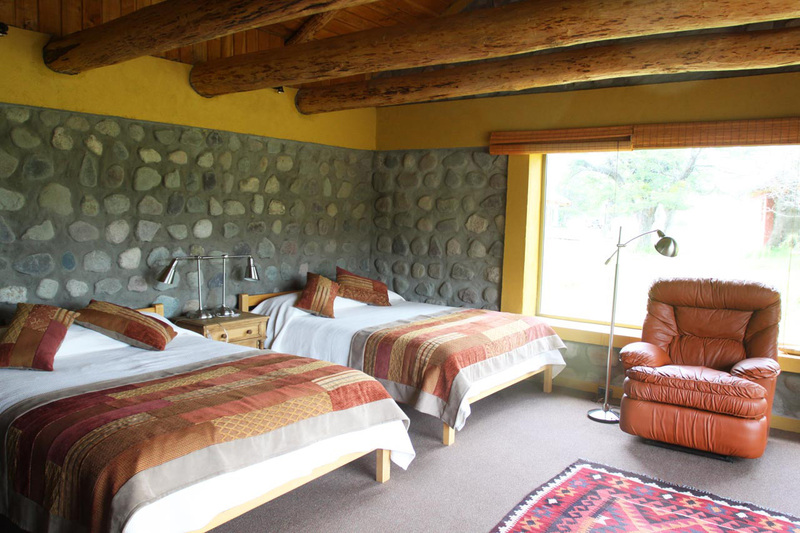 Robin and Bernadette shared a impossibly cute stone cabin where they both had their own rooms and ensuites (large enough to swing a cat around in) and a shared living room with a pot-belly fire place, squishy couches with alpaca throws and spectacular views of the shimmering lake and river that curved its way through the mountain ranges. 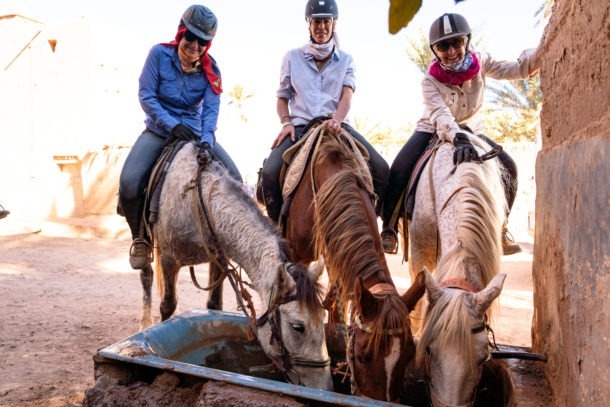 Even though we spend most of our time on horseback its so important that when you return wet and sodden if you were caught in the weather on a ride or aching from too many hour in the saddle that you have a place for respite where there are hot showers, a couch to curl up on and read and a bed made for sleeping. 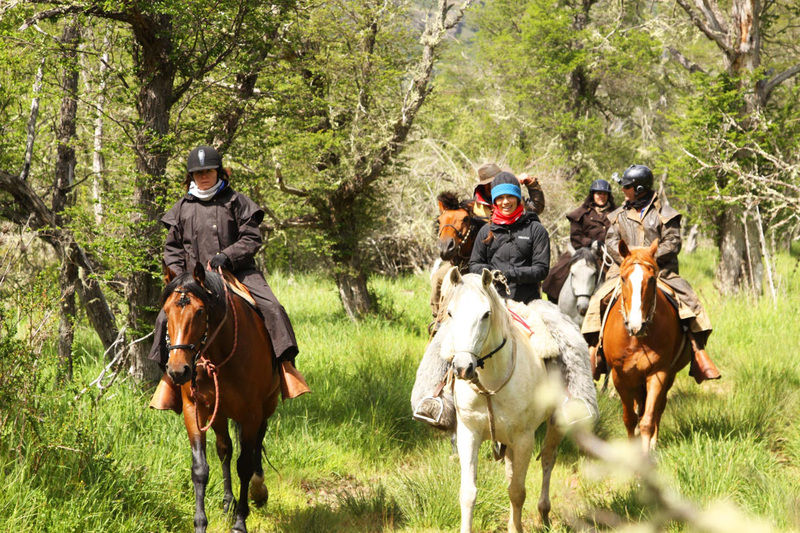 The wonderful part about a Patagonian summer is the days are so incredibly long so much so you can be on horseback until 7pm at night and its still light. Eager as we can be, we went for our first introductory ride that afternoon. 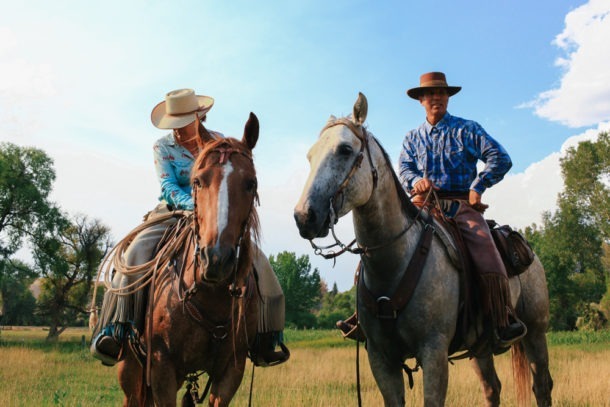 With all of my globetrotting rides there is always a introductory ride so horse and rider can get to know each other before committing to each other for the riding holiday. 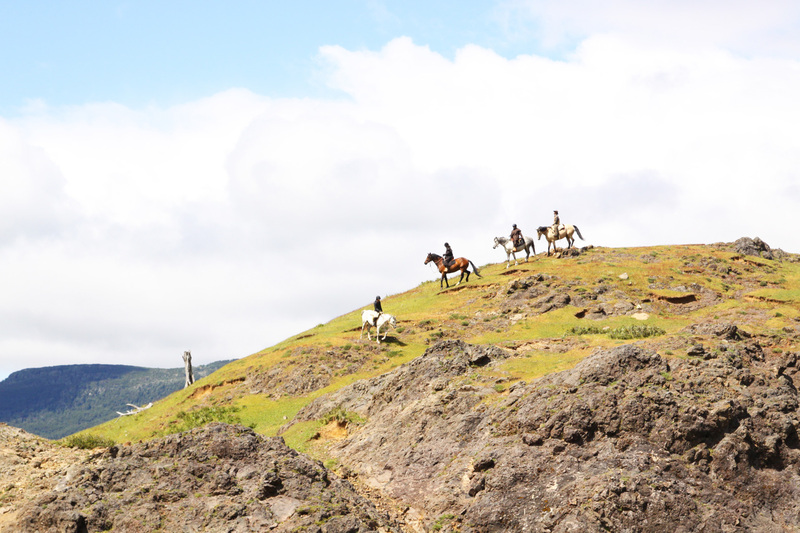 The next five days we fell into a beautiful rhythem of riding every day rain, hail or shine. To tell you the truth, we had cracking weather for the entire time we were there and you’ll see with the photos. 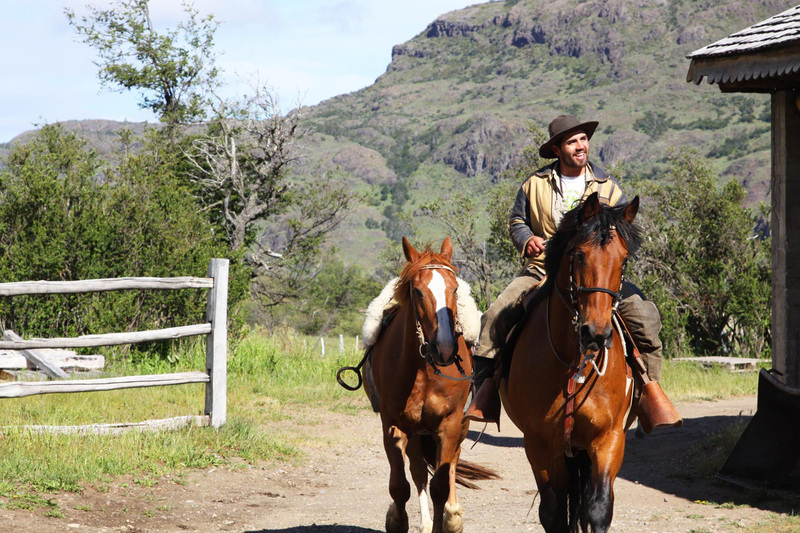 We were all mounted in traditional Chilean saddles and were as comfortable as if a armchair was strapped to your horses back. 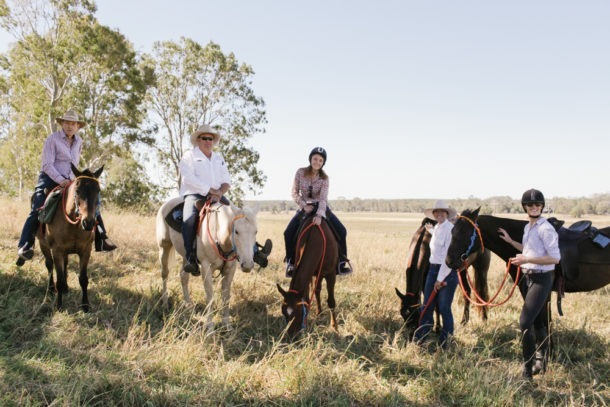 I rode a selection of horses, this I always try to do, to make sure that there is a good range of horses suitable for guests of every ability. The horses definitely got my tick of approval. They were forward moving, soft in the mouth, alert but not silly, happy to be at the front of the group or at the back taking photos, and all keen-as-mustard to jump anything you pointed their nose towards. 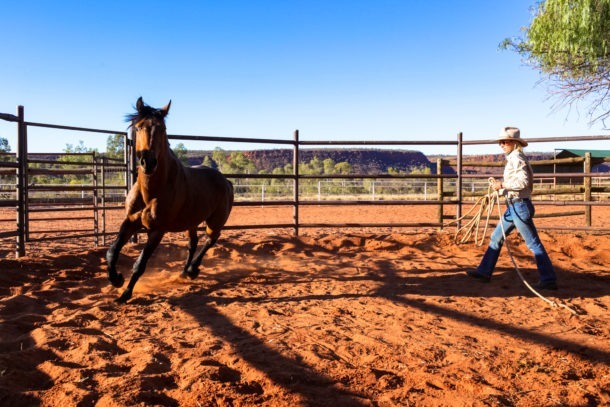 This is what I adored about this ride, I love to cross-country jump and every paddock we rode through there were fallen trees begging to be high jumped. 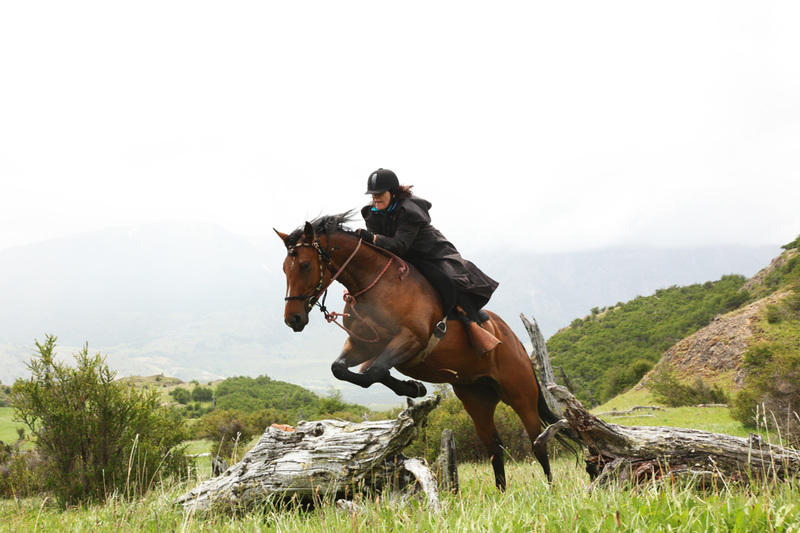 Our host Natalia has the same penchant for jumping and speed as I do, so it was incredibly fun to tear around the paddocks leap-frogging over logs. 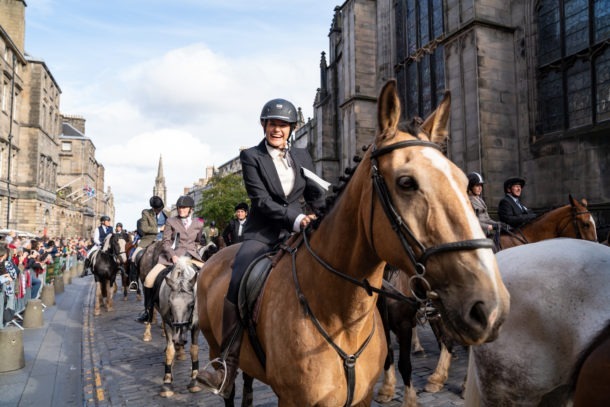 For most of the trip I was on a smashing 15hh grey gelding known as Vodka and I adored him, you didn’t have to ask twice for him to jump over something and he always had his ears pricked looking for action. That’s us above, there is nothing award-winning about my jumping style, but I lurve to jump it puts a smile on my face. Check out the riding attire – drizabone, beanie, must of been a cold day. The saddle bags we lug all over the world, they are custom-built to fit our camera equipment and they’re the ducks nuts, more on that in a later blog post. Above is globetrotter Bernadette jumping over a log textbook style. 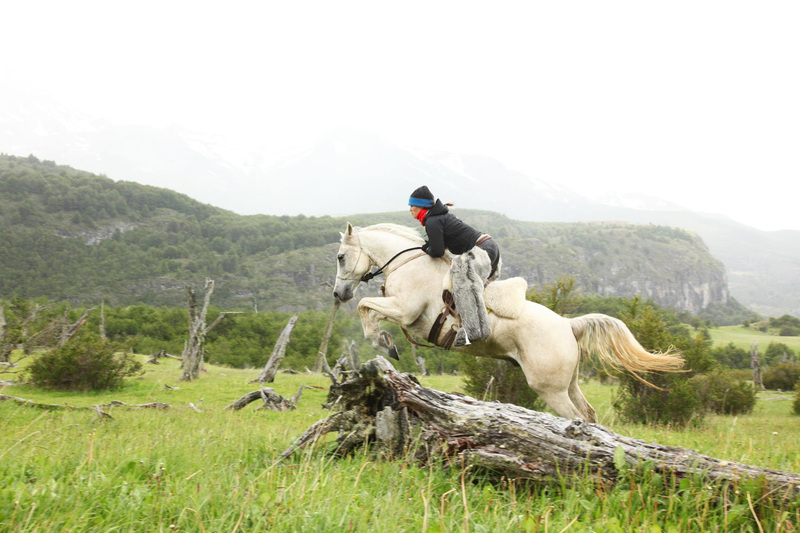 Each day brought a brand new adventure exploring, traversing and navigating every nook and cranny of the estancia and beyond. With so much to discover and in such a brief time we sucked every riding moment out of the day. 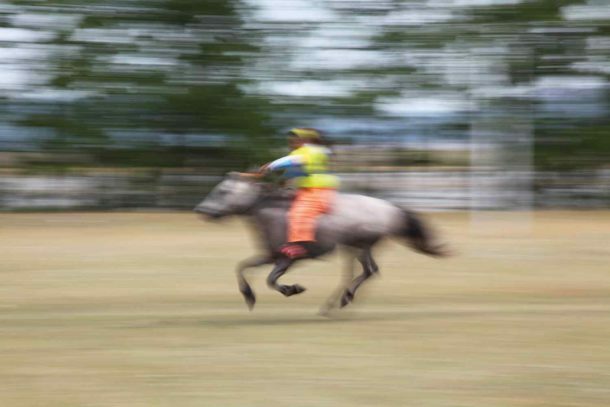 There were hell-for-leather gallops through lush green valleys where the grass was high enough to tickle the horses belly. Steven and I filmed and photographed this, I can still hear the yips of excitement from my riders high on adrenalin that echoed through the valley. Climbing like mountain goats to summit a bare, craggy plateau to watch the clouds dance overhead and absorb the scale and grandeur of the region. A handful of sun-kissed picnics where elaborate lunches were pulled out of saddle bags like a magician with a bunny in a hat. A spread of bottles of wine, steak burgers,bars of chocolate that we grazed on. At one lakeside picnic our chef who had ridden with us that morning to our destination proceeded to build a fire and cook a award-winning chicken curry while we sipped on vino tinto- oh so very decadent I hear you say. And then with bellies full we would dozed under the warmth of the sun while listening to our horses munch happily on sweet grass nearby. Moments where I have to pinch myself where ordinary life seems so very far away. 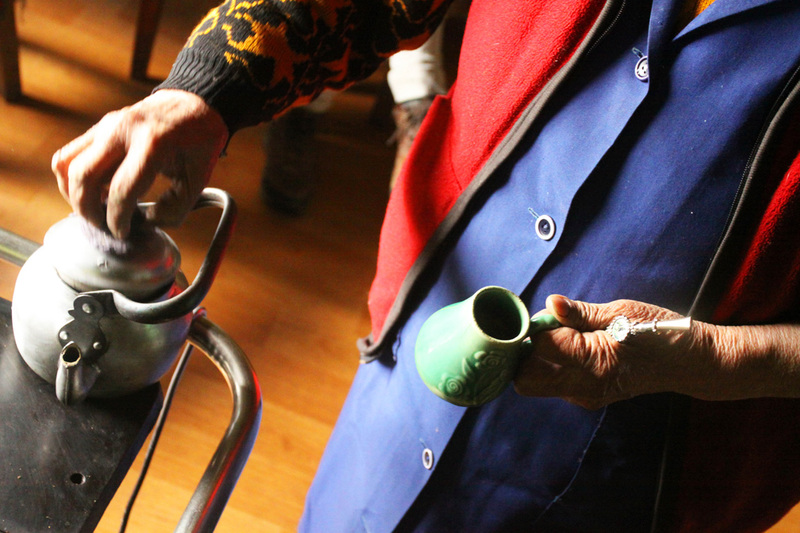 Learning the fine art of taking matte with Chilean characters that we met along the way. 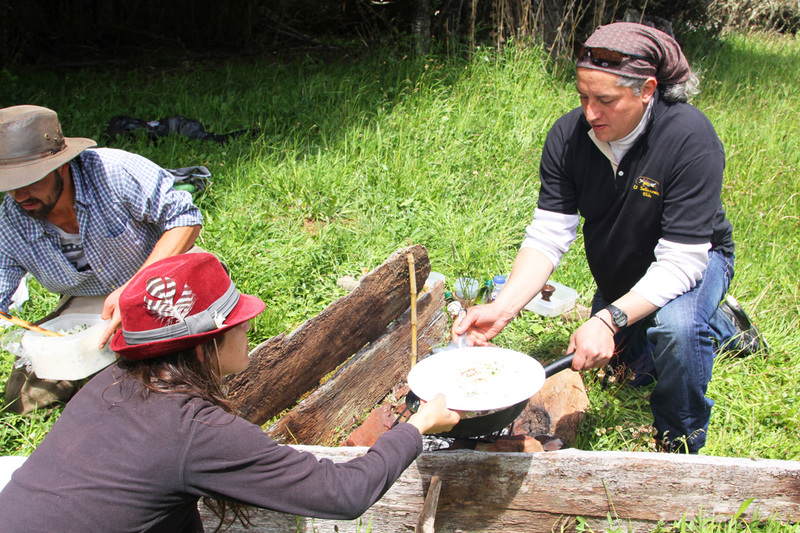 With Sebastian or Natalia translating the Spanish vernacular for us and telling our subjects story while teaching my guests the etiquette of taking matte was a memorable time. In a fast-paced world where everything is instant, the ritual of matte in the campo is nearly as spiritual as going to church every Sunday for these folk. G.T guest Robin pictured above having her first slurp of matte. Always in search of action shots for our growing portfolio of images we make our guests do crazy things. 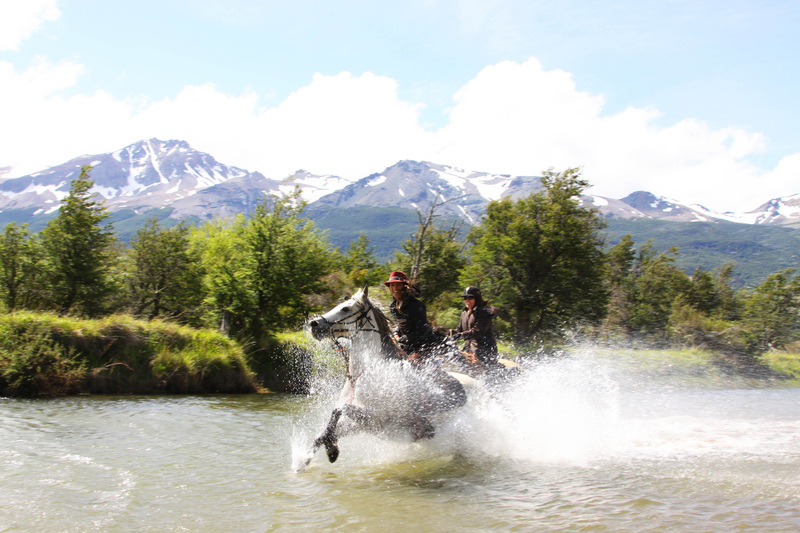 On our last riding day, Robin, Bernadette and Natalia used the icy river as a race track to canter through the middle of it while we filmed and photographed. The water temperature was arctic and they were drenched from head to toe once we had finished with them but you couldn’t wipe the smile off their faces. 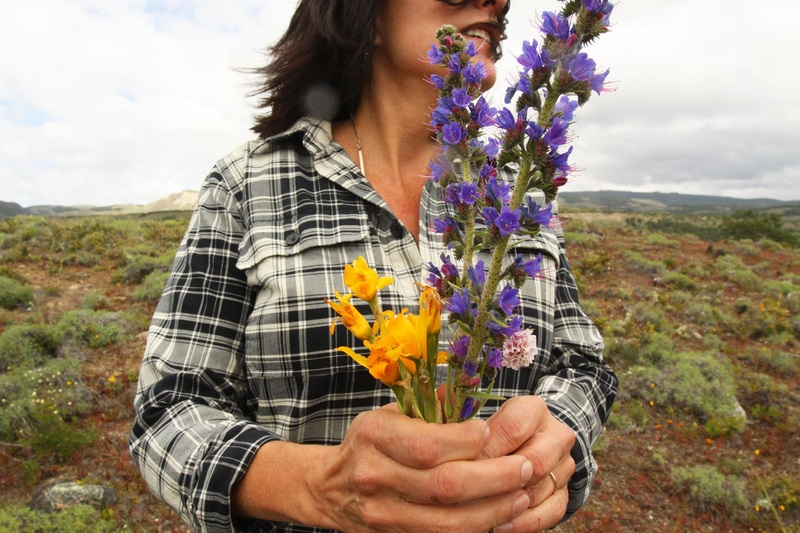 Early December was perfectly timed with the wild flowers in full bloom. 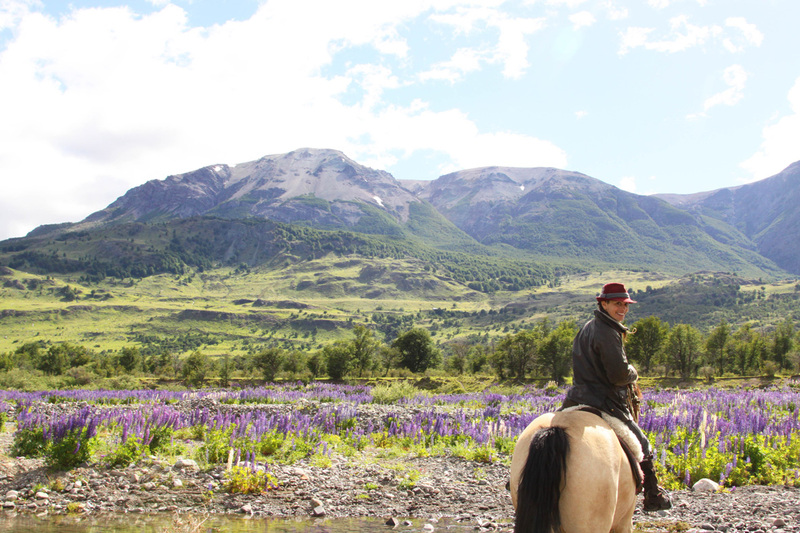 We rode past paddocks, river beds, mountain tops filled with lavender, mauve, candy pink coloured lupins. I felt like I was riding through the set of Little House on the Prairie or a flower market. 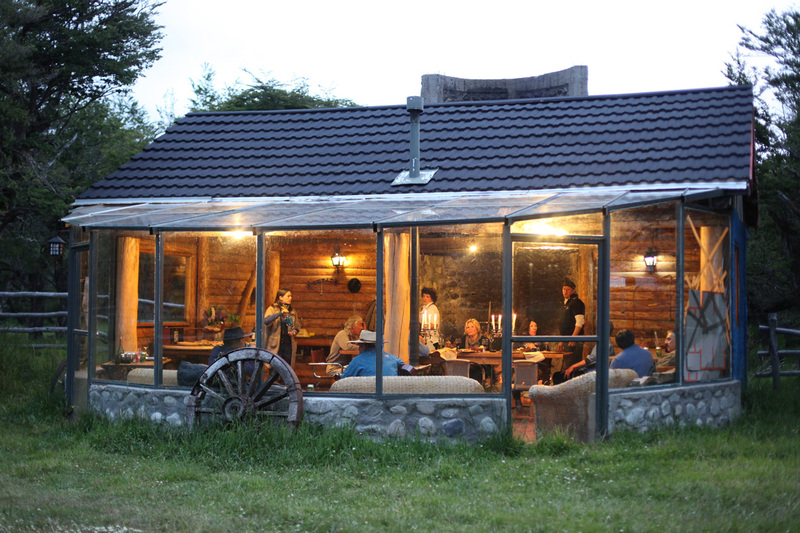 On our last night we were treated to a Chilean fiesta in their purpose built stone cottage. It was a great send-off and a lovely end to a superb week, we munched on lamb cooked traditionally on a asado, drank far too much Chilean red wine and listened to live folklorica music and danced out-of-step with the locals. My cheeks blushed red with the warmth of the entire six days spent in this raw, beautiful part of the world. 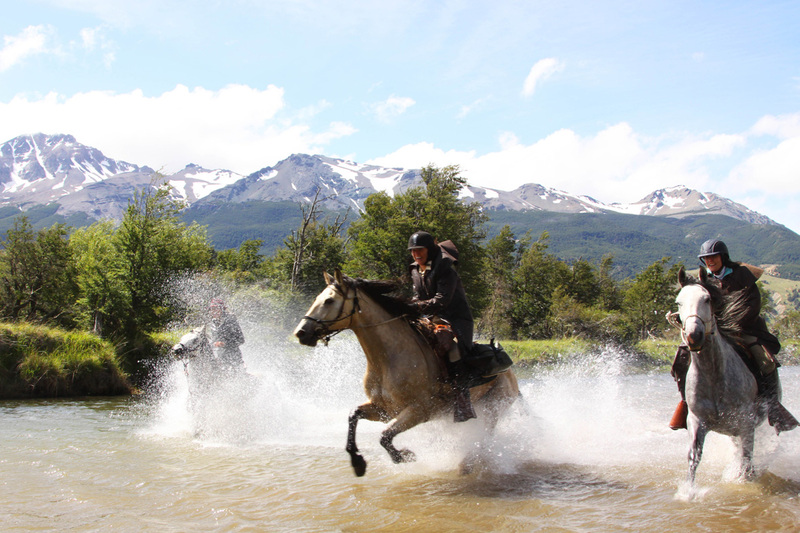 We’ll be visiting this estancia again this year (2013), so head over to our website for more details.